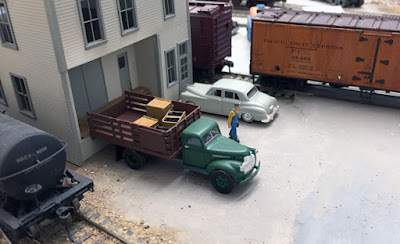 I wrote several posts about HO scale figures earlier this summer, then wrapped up that topic for the moment in Part 7, which was about figure placement (the post is at: http://modelingthesp.blogspot.com/2017/08/figures-part-7-more-on-placement.html ). I have since received a few comments on the topic, along with some questions about specifics, so I want to address those areas in the present post. One perceptive comment on Part 7 was the observation that the folks sitting at picnic tables by my Dolphin & Anchor tavern had nothing to drink. The tables were visibly bare. I was aware of that, but hadn’t gotten around to doing anything about it. But upon reading that comment, I thought, “I can’t be the first person with this problem — somebody must have made beer or cocktail glasses in HO scale.” Then it hit me. It is the makers of figures and layout details in Germany who have produced practically everything under the sun that you could imagine. Surely a serious beer-drinking nation like Germany must by now have created an answer to my problem. After a brief Google search, of course I found out I was right. Here is one of the products that came up, from Busch. They are mugs, rather than glasses, and note that they come in beer-colored yellow, clear like an empty glass, and gray for stoneware mugs, as are common in Germany. 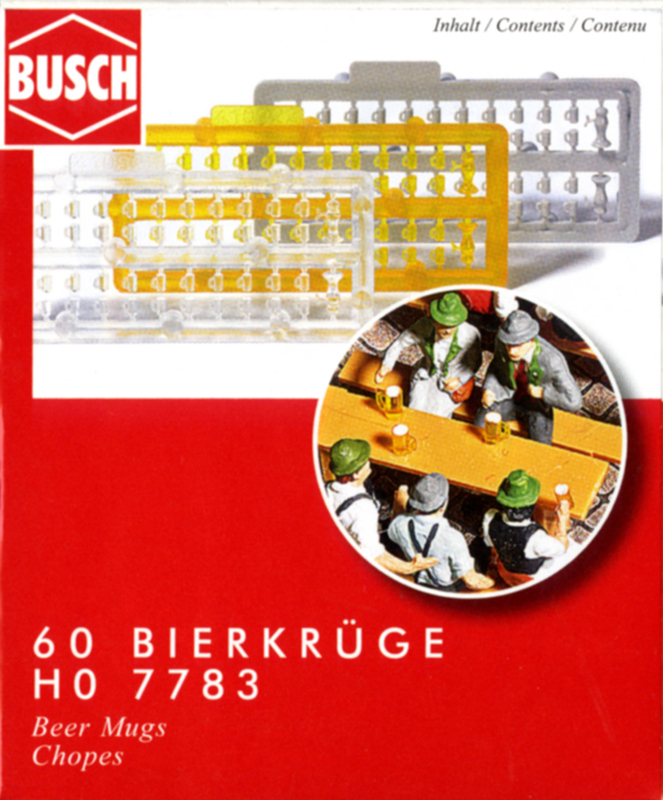 In the package photo, the beer glasses have white tops, suggesting foam. The model glasses don’t come that way but it would be easily added with white paint. The woman using a hand mirror while she fixes her hair is a Preiser figure. I also wanted to include a few more comments about figure placement and groupings. I especially like to use figures as part of industrial situations where workmen could be present, ideally doing something that fits with the particular business. 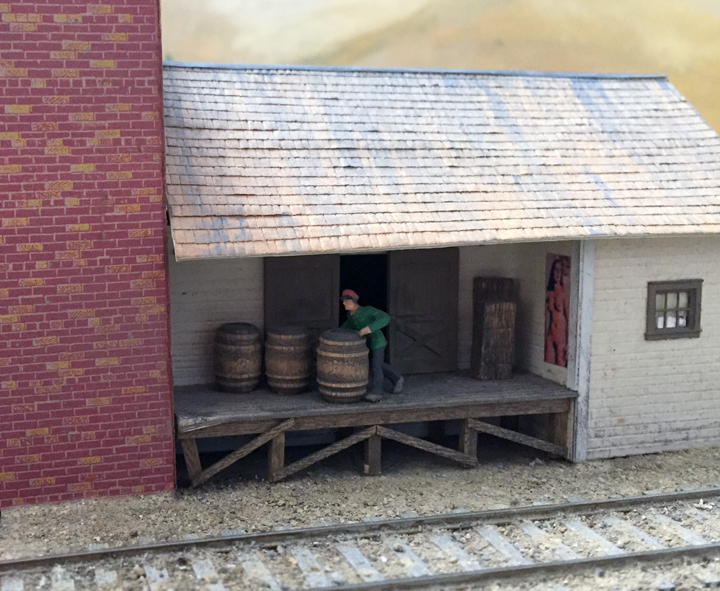 Here is a workman moving barrels at my Wine Growers Association building in my layout town of Ballard. In my era, lots of blending wine was shipped in large barrels like this. I am careful not to use figures in “dynamic” or exaggerated poses. The workman in the photo above may be in the process of moving a barrel, but might just be pausing in that process. The same would go for any figure shown as walking. As long as they appear to be moving slowly, I don’t feel such figures are out of place. Here is a workman leaving the Guadalupe Fruit Co. building, alongside a truck delivering field boxes of fruit. These kinds of details are easy to arrange, and if you put a base on each figure, as I do, they are easy to re-arrange or replace. I like to move figures around on the layout, so the same workman or bystander isn’t always doing the identical thing at the identical location. (But of course some of them are sufficiently suited to particular locations that they do tend to remain there.) Still, with many other figures moving from time to time, I believe an overall variety is created. I guess the point I want to make is that details like these do matter, and are worth a little time and thought to get right. Don't overlook Vectorcut's hamburgers and hotdogs. Punch list? What punch list? 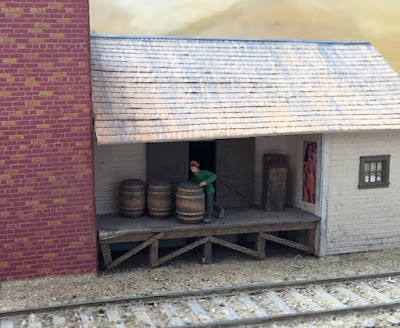 A long-time SP modeler in HO and a California native, Tony Thompson is interested in SP history, and has published both magazine articles and books on this subject. He wrote the modeling column in the SP Historical and Technical Society’s magazine, Trainline, for 25 years, and served five years as the Society’s President. He is retired from a career in university teaching and research, as a materials scientist interested in mechanical properties of materials. For more, go to: http://www.signaturepress.com/authors/awt.html . He is a partner in Signature Press book publishing. To see their books in print, go to www.signaturepress.com .